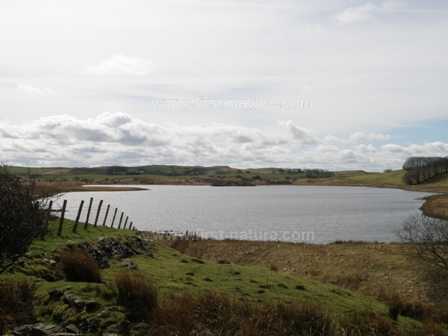 In an area with many lakes and ponds, Llyn Eiddwen is much more significant in terms of its wildlife than others in the area. It is the type of natural lake that is described as being 'oligotrophic-mesotrophic' which is a scientific term relating to the amount of nutrients found in the water. In the case of Llyn Eiddwen low levels of nutrients indicate that the water is purer than that of other lakes in the area, which are enriched or polluted by agricultural run-off, and this in turn, means that Llyn Eiddwen is able to support a number of very rare plants that could not survive in most other lakes. This NNR is owned and managed by the Wildlife Trust of South and West Wales. Llyn Eiddwen is not easy to find, and getting to it involves travelling along some very narrow lanes, but it is in a beautiful area and well worth the effort. From Aberystwyth take the A487 in the direction of Aberaeron, but turn left onto the A485 at Llanfarian towards Llanilar. 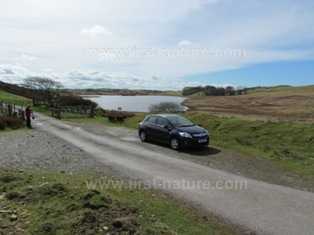 Continue through the small village of Pentre-llyn and carry on along the A485 towards Bontnewydd. Pass through Lledrod and Bronnant and then turn right towards Bontnewydd on a small unmarked road just beyond Bronnant. Continue along this road, passing through Bontnewydd and always bearing to the right. You will eventually see a right-hand turn signed Llyn Eiddwen, and you will come to a parking spot, shown in the picture below, right beside the lake. There are no real tracks to the lake, and the going can be rough and very wet underfoot so please take care, and wear good walking shoes or wellington boots. The terrain is not suitable for wheelchair users or for people with prams or pushchairs. There are no facilities on this site. There are some really unusual and rare plants in the lake, around the edges, and in the surrounding area. 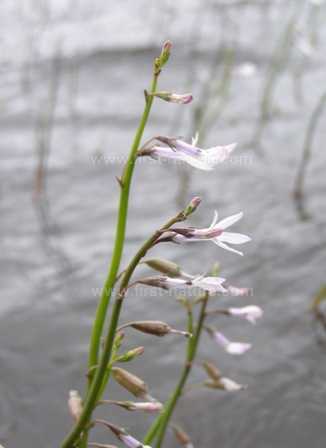 Among the most beautiful of them is Water Lobelia (Lobelia dortmanna) which grows up from the bottom of the lake with long infloresences rising well above the surface of the water. The flowers, which appear from July until September, are a very pale lilac pink and make a lovely display in high summer. 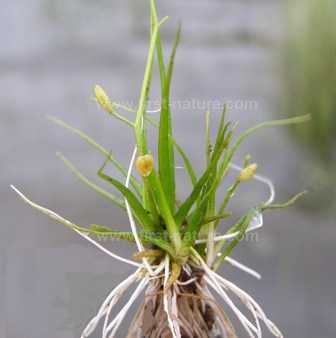 Other interesting plants in or close to the lake are Shoreweed (Litorella uniflora), Floating Water-plantain (Luronium natans) which is very rare, Awlwort (Sublaria aquatica), and two of the three Quillworts that occur in the UK - Quillwort (Isoetes lacustris) and Spring Quillwort (Isoetes echinospora). The southern shore of the lake is dominated by Bottle Sedge (Carex rostrata) and Water Horsetail (Equisetum fluviatile), while other parts of the shoreline have fine stands of Common Cotton Grass (Eriophorum angustifolium). The surrounding area of the lake also has some interesting plants ,and you can expect to find heathers, Heath Bedstraw (Gallium saxatile) and Tormentil (Potentilla erecta) in spring and summer. The boggy piece of land north of the lake has carnivorous Sundew (Drosera rotundifolia), golden-yellow Bog Asphodel (Narthecium ossifragum) and the beautiful flowers of Cranberry (Vaccinium oxycoccos) growing amid the various bog mosses there. Llyn Eiddwen is a good place to see birds, too, both in summer and winter. Coots (Fulica atra), Mallards (Anas platyrhyncos), Common Teal (Anas crecca), Pochards (Aythya ferina) and Wigeon (Anas penelope) take refuge here in the winter, and we never fail to see Buzzards (Buteo buteo) and Red Kites (Milvus milvus) whatever time of year we visit the lake. There are a good number of insects found on the reserve, too, and these include aquatic invertebrates such as the lovely blue Keeled Skimmer (Orthetrum coerulescens) and the caddis fly Ceraclea fulva. They, no doubt, provide excellent food for the wild Brown Trout (Salmo trutta), Pike (Esox lucius), Three-spined Sticklebacks (Gasterosteus aculeatus) and Minnows (Phoxinus phoxinus) that also share the water with them.